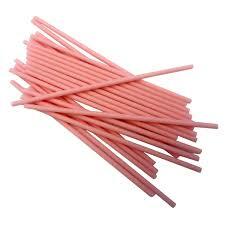 Packs of 25 high quality plastic PINK lollipop or cake pop sticks - 15cm/ 6 inch. BE SURE TO CHECK-OUT OUR LOVELY RANGE OF CHOCOLATE MOULDS & BUTTONS! WE ARE HAPPY TO COMBINE POSTAGE!